It’s time to stand up for the little guys. Middle schooler Roy Eberhardt is the perpetual new kid on the block. Due to his father’s job, Roy’s moved so many times he’s lost track of how many schools he’s attended (six since kindergarten) and how many towns he’s lived in (that would be ten) in his fourteen years of life. You could say he’s perpetually a stranger in a strange land. This time, he’s left the big sky country of Montana for the tropical sun belt of Florida and a sleepy Gulf Coast hamlet named Coconut Cove. The first thing he must do (if he is to avoid being called ‘cowgirl’ by his new classmates) is trade in his boots for flip flops and his western ‘dude’ shirt for a tank top. The second thing he notices is that Florida does not have 10,000 foot mountains like Montana, but is as flat as a pancake. Lastly, he quickly recognizes that, just like everywhere else he’s been, Florida has its share of bullies. That’s always been part of the drill for the new kid in town. And, on his first day at Trace Middle School, Roy’s about to meet the biggest bully of them all –Dana Matherson, a hulking monster with a girl’s name who greets his new schoolmate by painfully sinking his fingers into Roy’s temples and smashing his face against the school bus window. But, in an odd way, Roy is indebted to Dana. You see, if Dana hadn’t dug his thumbs into Roy’s neck and scrunched his face against the glass, he would never have spotted the barefoot running boy – a wiry, blonde-haired runaway without books, backpack or shoes – outpacing the bus in the stifling heat and humidity. And, if Roy had not spotted the curious, mysterious running boy (whom he finds out is called Mullet Fingers), he would not have met Beatrice Leep, the running boy’s scrappy stepsister and fellow 8th grader who just happens to be the toughest kid at school. Someone who strikes fear in the heart of every boy at Trace, even the bully Dana. And, if Roy had not met Beatrice Leep, he would not have heard about the new restaurant planned for Coconut Cove – Mother Paula’s All-American Pancake House, one of the country’s most popular chains. Had he not known about the new eatery about to break ground under the watchful eye of the company’s overambitious P.R. executive, Chuck Muckle, he would not have unearthed a disturbing threat to a local population of endangered owls, whose burrows happen to be right on the construction site where the malicious Muckle and his foreman, the dimwitted Curly Branitt, are racing against the clock to erect their new franchise. And, if Roy had not tried to protect his new environment, he would never have experienced the thrill of a lifetime, one that brings him into contact with potty-trained alligators, the nest of burrowing owls, a group of poisonous cottonmouth snakes with strangely sparkling tails and a host of quirky human characters, including corrupt politicians, the beleaguered construction foreman, Mother Paula herself and Officer David Delinko, the diligent but clueless local beat cop whose investigation into some mysterious, extraordinary circumstances at the construction site may just earn him the detective stripes he so urgently wants. Roy’s Floridian adventure is turning out to be quite a ‘hoot’! New Line Cinema and Walden Media present Hoot, the motion picture adaptation of Carl Hiaasen’s Newbery Honor family bestseller. The film is a Kennedy/Marshall Production and co-venture between Walden Media (Holes, The Chronicles of Narnia: The Lion, the Witch and the Wardrobe, Because of Winn-Dixie) and New Line Cinema. Logan Lerman (WB’s “Jack & Bobby,” The Patriot, The Butterfly Effect) stars as Roy, the Montana transplant whose valiant efforts to protect the environment endear him to his new Florida schoolmates. Luke Wilson (The Royal Tenenbaums, Old School, My Dog Skip) also toplines the cast as Officer David Delinko, the earnest, unenlightened local Coconut Cove cop investigating some mysterious incidents at the proposed construction site. 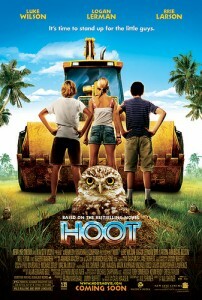 Hoot also boasts a cast of some of Hollywood’s upcoming young talent, including Brie Larson (13 Going on 30, TV’s “Raising Dad”) as Beatrice, the scrappy fellow 8th grader who embraces Roy’s assistance in saving the owls; Cody Linley (My Dog Skip, Rebound, Cheaper by the Dozen) as Mullet Fingers, the vagrant runaway who spearheads the kids’ attempt to foil the restaurant’s groundbreaking plans; Eric Phillips, in his very first motion picture, as Dana Matherson, the towering school bully who painfully antagonizes Roy upon his arrival at Trace Middle School; and Dean Collins (WB’s “Jack & Bobby,” Fox’s “The War at Home”) as the goofy screwball Garrett, Roy’s first friend at Trace. The film’s adult co-stars, a veteran cast of familiar faces, includes Kiersten Warren (13 Going on 30, Intolerable Cruelty) and Neil Flynn (NBC’s “Scrubs,” Mean Girls) as Roy’s tolerant, yet exasperated, parents; Tim Blake Nelson (Holes, Minority Report, O Brother, Where Art Thou?) as the besieged, outwitted construction foreman, Curly Branitt; Clark Gregg (State and Main, One Hour Photo) as the sinister pancake house executive, Chuck Muckle; Jessica Cauffiel (Legally Blonde, D.E.B.S., White Chicks) as the vivacious actress who dons wig and aged makeup to portray the eatery’s matronly namesake, Mother Paula; and longtime Hollywood star Robert Wagner (Austin Powers trilogy, TV’s “Hart to Hart”), who embodies Coconut Cove’s slick municipal leader, Mayor Grandy. Hoot marks the big screen directorial debut of Wil Shriner, a veteran TV host (“The Wil Shriner Show”), director (“Frasier,” “Becker,” “Everybody Loves Raymond”), actor (Peggy Sue Got Married) and comedian, who also adapted the screenplay from Hiaasen’s 2002 novel. Frank Marshall (The Bourne Supremacy, Seabiscuit, The Sixth Sense, Raiders of the Lost Ark) produces along with singer/songwriter/author Jimmy Buffett, who marks his debut as a movie producer and provides five songs for the film. The executive producers are Toby Emmerich, Kevin Reidy and Gregg Taylor. The co-producers are Wil Shriner, Carl Hiaasen, Mark Kaufman and Michael Disco. editor Alan Edward Bell (The Story of Us, Alex & Emma). Susan Humphrey, of Florida’s Birds & Animals wildlife sanctuary (the Harry Potter series), oversaw the training of the various creatures (including a trio of burrowing owls) used before the cameras. Hoot, which filmed almost entirely on location in the Sunshine State, with additional photography in Montana and Los Angeles, began principal photography on July 6th, 2005 and wrapped production on September 2nd, 2005. The film’s principal locations included Ft. Lauderdale on Florida’s Atlantic coast and the Gulf Coast hamlet of Boca Grande on Gasparilla island.